You can give the same series of motions that you created for one layer to another. These motions may include moving, rotating, scaling and skewing. An example would be a car tire. You could animate the rotation of one tire and then link that rotation function to another tire, so that they both rotate together. The tire may also move up and down if it is driving along a bumpy road. This would mean that you would have to copy the x and y-axis position functions as well. Linking motion works with many layer types, including drawing, peg or 3D subnode. In the example below, the rotation from a peg will be copied onto a drawing layer. In the Timeline view, double-click on the layer. In the Node view, click on the node's yellow square. 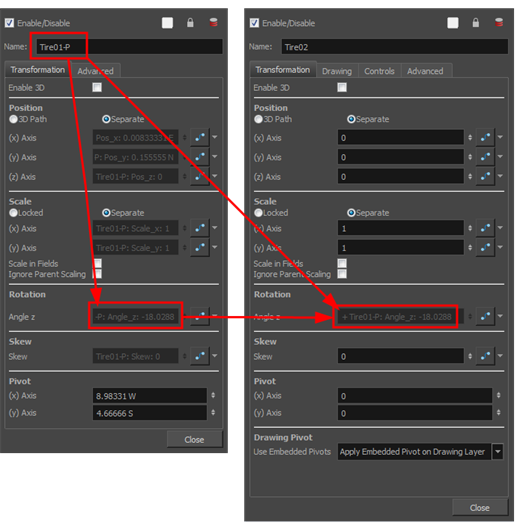 In the Layer Properties, locate the parameter you would like to copy, for example Rotation: Angle z, then open the function menu for that parameter, by clicking on the arrow button at the end of the row. In the function menu, select Copy Function Link. Open the Layer Properties for the second element. You can have the Layer Properties for both elements open at the same time. If you plan to perform multiple copy-pastes, it may be a good idea to keep them both open. Verify that the motion types are the same for both elements. For example, if the Position type for your first element is set to Separate, be sure that the Position type for your second element is set to the same. In the second element's Layer Properties, open the function menu for the same parameter, for example Rotation: Angle z. In the function menu, select Paste Function Link. Notice in the parameter's function field that the copied motion function appears, including the name of element that the function was copied from. In the Timeline view, all the keyframes relating to that motion appear in the Timeline. In the Camera view, slide the red playhead back and forth to view the two linked objects. Repeat steps 2-8 for any other motion that you would like linked. Simply deleting the keyframes from an element that was linked to another does not break the link between the two objects. You must clear the function field for all linked parameters in the Layer Properties of the linked element. Open the Layer Properties of the element which contains linked functions. Open the function menu for a parameter with a linked motion function and select Local. The property field is reset to 0.